Shrewsbury – There have been many discussions and meetings lately regarding the plans for the Major Howard W. Beal School, located in the center of town. This leads us to ask – just who was Major Howard W. Beal? He was born in Maine in 1869, then went on to college at Andover and Harvard. He went on to become a respected Doctor in the Worcester area, but living in Shrewsbury on Lake Street. Although his life was cut short during World War I, details of his many accomplishments were well documented. There were a number of newspaper articles devoted to him, both before and after his death, one of which tells how he worked in England in 1914, providing medical services to wounded British soldiers with the Red Cross. His work was recognized by none other than Queen Mary, who visited the wounded at his hospital, with Dr. Beal escorting her around. 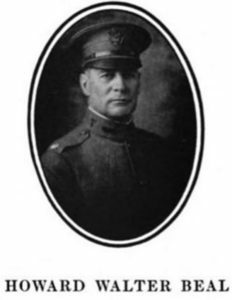 Later, when the United States entered the war, Major Beal volunteered to serve with the U. S. Army Medical Corps in France. It was here, while living in a tent along the trenches, that tragedy struck. It was late at night on July 18, 1918, when Major Beal stepped outside to try to get some fresh air. A German plane dropped a bomb (which was very unusual in World War I, especially at night), which exploded near him, wounding him in the chest. He was evacuated to a hospital, but his wound was deemed to be untreatable, He died a few days later and is buried in the cemetery at Suresnes, France, Plot B, Row 4, Grave 32. As a fitting tribute to this dedicated Doctor and patriot, some of his friends commissioned a book, published in a limited edition in Paris, France, which included many of his letters written to home, along with a glowing tribute to the man himself. Included here are a photo of Maj. Beal and a photo of his grave marker at the American Cemetery in Suresnes, France. The Major Howard W. Beal High School was built a few years later, named in his honor. Later, the World War I veteran’s monument was dedicated by Mrs. Beal, which stood in front of the school until just recently being replaced. During World War II, blackout restrictions required that the gold ball at the top of the monument’s flagpole be painted black, which apparently annoyed Mrs. Beal! A little known fact is that the gymnasium in the school was named Nee Hall, after Pvt Michael Nee, who was killed in action during World War I, a young man from Shrewsbury who lost his life defending our freedom. Hopefully both the names of Maj Howard W. Beal and Pvt Michael Nee will be preserved in the event a new Maj Howard W. Beal School is built.